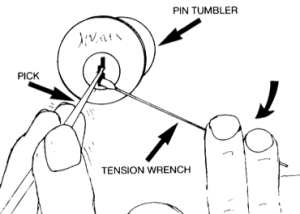 Lock picking is considered by some to be the original "hack". Long before computers there were locks and someone who wanted to manipulate them. The common misconception when picking a lock is that the process is difficult when, in actuality, it is quite simple. There are my methods to picking a lock but for this post we are going to go over the most basic method, “raking” or “scrubbing”. Insert the rake into the lock and make sure you are past the last pin. I like to push all the pins up so I can feel where the rake is placed in the lock. If you do not have a rake, one can be purchased from us. Insert the tension tool into the lock not to obstruct the rake. Tension tools can also be purchased here. Apply sight pressure on the tension tool in the direction you want to open the lock. This is the most difficult step in the process and will take some time to learn the right amount of tension. When teaching I like to use a rubber band on the end of the tension tool and pull just to when the rubber band starts to stretch. Try not and touch the walls of the keyway and pull the rake straight out in one solid fast motion. If the lock does not open on the first try don't fret, insert the rake again, adjust your tension, and repeat the process. Even though this is a simple way of picking a lock it will still take a good deal of practice and time to learn the skills and movements involved. One great tool for learning how to pick locks is the Lock Pick School in a Box .